The WWII ruins of what used to be one of Berlin's finest train stations, and a huge bunker, part of which houses two exhibitions set up by Berlin Story, including the world's first complete exhibition of the history of Adolf Hitler, the Third Reich and its downfall, incorporating a special documentation about the infamous Führerbunker. More background info: The Anhalter train station in Berlin, opened in 1880, was at its time the largest and certainly also one of the grandest train stations in the world. Its single span steel and glass roof was 112 feet (34m) high, 200 feet (62m) wide and 560 feet (171m) long. The whole architecture was exceptionally ornate and fit for the imperial capital that Berlin was then. It was named after the Anhalt region to the south of Berlin and was for many decades the main terminus for trains to/from the south, e.g. Munich, Vienna, Rome or even Athens. Towards the end of WWII, in early 1945, the station was hit by air-raid bombings, burned out and the roof collapsed. The massive walls, however, remained standing. After a post-war period of re-use as a (roofless) station, it was eventually closed for good – mainly because it had lost its purpose: now its lines heading south led straight into East Germany, i.e. 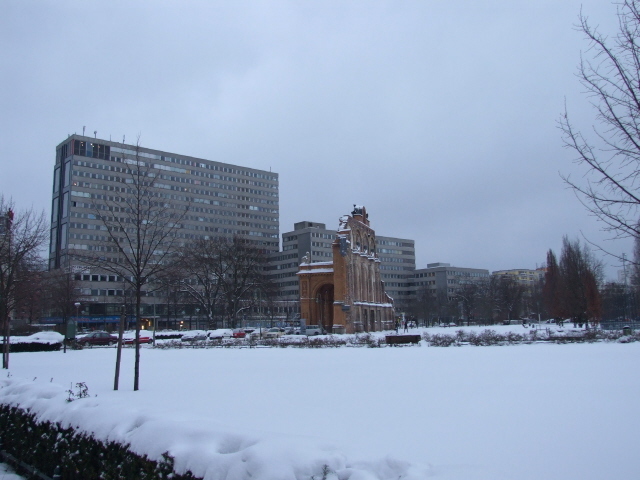 the GDR, part of the Warsaw Pact – but Anhalter station was left in the West Berlin island controlled by the Western Allies USA, Britain and France. Obviously, no train lines into "enemy territory" were needed or desirable (and were cut off by the Soviets in the East anyway). So the building and the whole extensive area around it became derelict. Most of the empty shell of the station building, even though not beyond repair, was eventually demolished (15 years after the war and despite massive protests). Only a small section of the main portal's façade was left standing and today serves as a kind of WWII memorial (the second most well known in Berlin after the ruins of the Kaiser-Wilhelm-Gedächtnis-Kirche). It's been restored repeatedly, and its glazed bricks now look almost too clean and new. To the west of the old train station area, an air-raid shelter in the form of a five-storey massive bunker was built in 1943. It has two underground floors, and three above ground and about 100 rooms. The reinforced concrete ceiling is 3.8m thick, the walls between 2m and 4.5m. A tunnel connected the bunker to the Anhalter station, so people from there could find quick refuge in the event of an air raid. The bunker was originally intended to provide shelter for 3,500 people, but in the end over 12,000 crowded inside during the bombing raids in the final phase of the war. That meant people had to stand tightly packed like sardines – five people per square metre, with temperatures rising to up to 60 degrees Celsius, as the air ventilation systems were totally overstretched. Needless to say, sanitation was also as good as non-existent. It must have been pure hell. Yet it was still deemed better than being blown to smithereens outside the bunker during the ever intensifying Allied air raids. 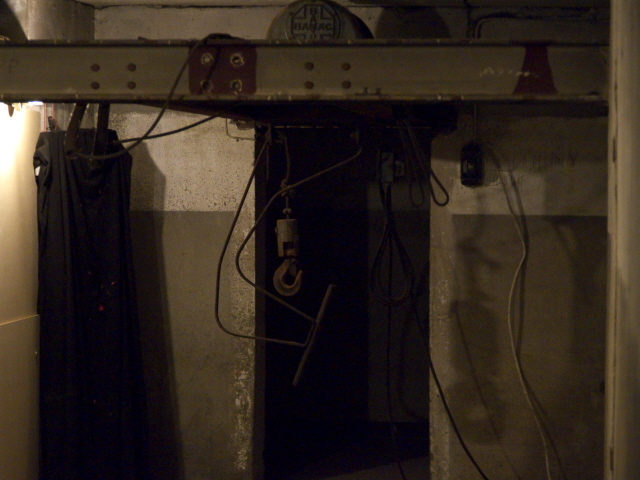 The bunker did get hit by bombs, and one large one created a crack in the structure. But apart from that and a few minor scars on the outside of the concrete it survived the war relatively unscathed. After the war, following the Berlin blockade and the Berlin airlift (cf. Tempelhof), the bunker was used as a government storage facility, namely as part of the city's “Senatsreserve” or 'senate's reserve': stocks of emergency food supplies (in particular tinned fish) held here in case another such crisis should arise. The stocks had to be replaced regularly, and the old stocks were sold off cheaply to the populace of Berlin just before they passed their use-by date. This was called “Umwälzung” (roughly: 'turnover') and provided for some legendary dishes such as a stew made from tinned beef and green beans (called “Moppelkotze” …). After the fall of the Berlin Wall and the subsequent end of the Cold War, keeping such emergency food stocks was deemed no longer necessary and the system discontinued. One historical irony in this was that about a quarter of the former emergency reserves were donated to the Soviet Union, i.e. the former enemy that had initiated the need for this system in the first place. But at the beginning of the 1990s, the USSR was ailing and heading towards its own dissolution, so the donation was made partly as an act of humanitarian aid and perhaps also as a sign of gratitude for the role the Soviets under Gorbachev had played in making the reunification of Germany, and Berlin, possible. In the mid 1990s part of the bunker was turned into a privately run “Gruselkabinett” (a kind of 'chamber of horrors' attraction including actors scaring visitors with all manner of pranks and scary masks and stuff). Later, the proprietor added an exhibition specifically about the bunker and its history. When I first visited the place, this was still in operation. It had its quirky attractions and certainly some very dark elements (especially a section about the Führerbunker) though it was also rather amateurish in its design, certainly very idiosyncratic. I must say that, despite its shortcomings in terms of modern museum design, I quite liked it for its often surprising and quirky elements. But it was not to last. Eventually the bunker was taken over by the Berlin Story company, and the old exhibition was replaced by a completely new one that also largely replaced the shop's own exhibition at their headquarters on Unter den Linden. Hardly anything of the previous bunker exhibition was incorporated into the new one. The “Gruselkabinett” ('chamber of horrors') was at first kept running in parallel of the now much more sober and contemporary museum (see below) but this coexistence was also deemed perhaps just a little too inappropriate for such a historic site and given the nature of the museum in the same building. Indeed, on the tours of the other, empty parts of the bunker you could often hear the screams of visitors to the “Gruselkabinett” – transmitted through the air ventilation system. It certainly made for some juxtaposition! So in October 2016, the “Gruselkabinett” closed. Part of the reason for this may also have been purely economical. The visitor numbers had been dropping for a while anyway – partly due to the high-profile competition by the new branch of the 'Dungeons' chain that had opened its Berlin branch near Alexanderplatz. The old 'chamber of horrors' props have been put into storage, and the parts of the bunker that it used to be housed in may be turned into yet more exhibition space for the museum and/or be incorporated into the bunker tours on offer. What exactly will happen with this remains to be seen. The text below describes the bunker and museum as I found them on my visit in August 2016. The old text about my visit in 2010, before all these massive changes, has meanwhile been relegated to the “lost places” section – that way you can at least still read my impressions of its previous incarnation. The newer Hitler exhibition, also curated by the Berlin Story outfit, opened its doors on 27 May 2017, and in June 2018 I finally had a chance to go and see it. My report is inserted below as well. The Berlin Story and Hitler exhibitions are run by a private company and have not been publicly funded in any way. But in particular the Hitler exhibition is done in a highly professional way and is pretty much state of the art nonetheless. What there is to see: At the ruined section of the former Anhalter station's front portal façade there isn't really anything else to see but just that. No commodification, no information centre or anything like that (in contrast to the Kaiser-Wilhelm-Gedächtnis-Kirche), so you need a lot of imagination to picture the original station or the post-WWII ruins. Near the ruins stands an information panel commemorating the deportation of Jews, namely to Theresienstadt, also from this station (although most deportation trains departed from platform 17 of Grunewald station). So at least some of the dark history prior to the bombing of the station is given some reference here. The more important attraction for the dark tourist lies just round the corner – in fact the bunker at Anhalter station is already visible from behind the station ruins. It's a massive grey concrete block. Follow the signs to 'Berlin Story Bunker' and you eventually come to a gate between modern buildings that takes you to the front of the bunker. Note the graffito “Wer Bunker baut, wirft Bomben” ('those who build bunkers also throw bombs') – it's a relic from the peace movement, painted onto the bunker by activists during the Cold War era. Up the steps or the ramp you can reach the entrance to the bunker museum. Bunker tours start (or used to start - see below) at a meeting point outside the bunker by some open-air information panels. When I was there in August 2016, I was lucky to arrive just as a tour was about to start and I was able to join it without having booked online in advance. It began at a different door to the museum entrance, a heavy steel blast door, and the group took a lift up to the top floor. The rooms in this part were largely empty, except for a few relics such as old suitcases and a couple of wooden benches. These benches, it was quickly pointed out, though, are a little misleading, as at the height of the bunker's use as an air-raid shelter there were so many people crammed in here that nobody would have been able to sit down in such comfort (see background). The guide had a little portable projector on him and used it to show images on the bare walls of the bunker to liven things up and illustrate the narration. This included pictures of people outside the bunker, period propaganda posters, images of the destruction caused by the bombing raids, as well as eyewitness reports recorded many years after the war. It was all very illuminating and well presented. UPDATE: since the opening of the Hitler exhibition (see below), those bunker tours seem to have ceased to exist. Now there are only guided tours through the exhibition(s). Whether tours of the parts of the bunker outside the exhibition space will resume at some point I don't know. It would be a good thing, though. The Berlin Story Museum inside the bunker is primarily about the history of Berlin as such, with an emphasis on modern (20th century) history, but not so much about this bunker in particular (though it does have some elements devoted to it). The exhibition is very modern and very visual, with large installations of objects, with mock-ups and original artefacts. And a decent amount of audio-visual media, without overdoing it. Labels/texts are in German and English, and you can also use an audio-guide, which is available in a choice of ten languages. The exhibition quickly goes from imperial Prussian times to the turn of the century, with some special emphasis given to the crammed and basic living conditions in Berlin's working-class tenement houses in the late 19th century. Following a rather lighter note on the “roaring 20s”, when Berlin was one of the world's foremost cultural centres in the world, we then head towards the darkest days, beginning with the rise of Nazism. Covered are aspects such as the book burning on Bebelplatz and the grand plans of the Nazi architects for turning Berlin into “Germania” as an OTT Reich's capital full of intimidation architecture (most of which was fortunately never realized – but cf. Tempelhof!). WWII is mainly represented through the effects it had on Berlin. One of the largest installations of the museum shows a landscape of debris and emergency messages – and also serves as a celebration of the city's “Trümmerfrauen”, literally 'rubble women', i.e. those female citizens whose job it primarily was to clear away all the bombing debris from the ruined city. 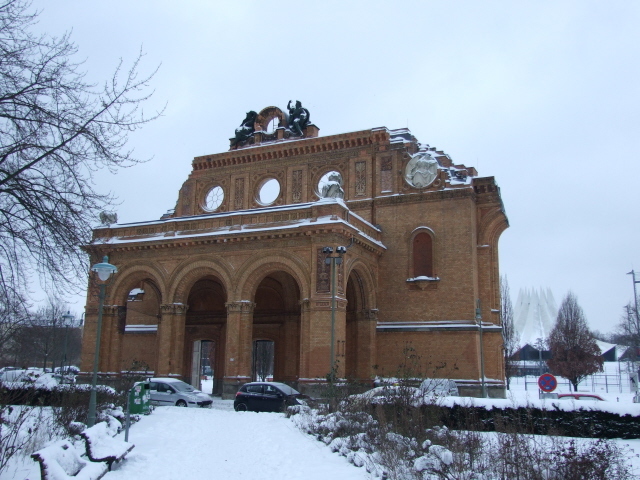 There is one section about the Anhalter station and the bunker the museum is housed in. On display are objects found inside the bunker as well as aerial photos of the district that show the gradual disappearance of the station. The representation of the post-war history of Berlin naturally takes separate paths. Following a section about the Berlin airlift (see again under Tempelhof) side rooms branch off following both West Berlin's as well as East Berlin's divided histories during the Cold War period. The East Berlin part has sections about the rigorous border controls, the Berlin Wall, the Stasi, including an original door from Hohenschönhausen prison, and everyday life in this alleged socialist society (see also Life in the GDR Museum). The peaceful revolution of 1989 and the subsequent reunification of Germany are obviously the crowning points of this part. The West Berlin half has sections about the “Wirtschaftswunder” ('economic miracle') of the 1950s, JFK's visit to Berlin in 1963, the student revolt of the late 1960s and how immigration of “Gastarbeiter” ('guest workers'), in particular from Turkey, came to characterize whole districts of Berlin, especially Kreuzberg. One aspect of the history of divided Berlin in which this bunker played a particular role was its use as a storage facility for emergency food supplies (the 'Senate's reserve – see under background) and this is represented by the display of some of the tins of fish that used to be piled high in here. Overall, I found the museum very entertaining as well as educational – and even though I was already pretty well informed about its subject matter it kept me engrossed throughout. So I can highly recommend it. Since May 2017, the largest space of the bunker, spread over three of the bunker's five floors, has been given to an all-new exhibition called “Hitler – wie konnte es geschehen?” ('Hitler – how could it happen?'). This now incorporates the model of the Führerbunker and the reconstructions of Hitler's study in it, which previously was accessible as a stand-alone exhibit on guided tours. At the desk in front of the entrance where you pay for your ticket you are also encouraged to use an audio guide (for a small extra fee). They are available in German and English. The German is narrated by the museum's founder himself, and interspersed with personal biographical anecdotes and observations, which is an added bonus. The translation of this into English is narrated by a native speaker, though, and is of good quality. The audio guide, however, is not indispensable – you can get almost all the relevant information from the written texts in the exhibition alone. The text panels and labels in the exhibition are bilingual too, and the English translations are generally fine, though there are occasional mistakes, such as the translation of “kritische Geister” as 'critical ghosts' (instead of 'critical minds'), which really is quite a major howler. The translations also follow the German in using the present tense when referring to historical chronology. In German this is a stylistic element typical for such a genre, but it does not work in the same way in English. I've encountered this in quite a few museums in Germany by now, though, so at least this one is in good company. The exhibition is subdivided into 38 sections, organized mostly chronologically, but also thematically. There's way too much to go through in detail, so I can only give a rough overview and pick out the odd special exhibit. The intro section is a bit surprising, as it turns the chronology on its head, as it were, as it is about Hitler after his death … – or rather about various conspiracy theories that claim Hitler did not commit suicide on 30 April 1945 but somehow got away and fled to South America (like so many other Nazis indeed did) or went into hiding in obscure places. All these wacky “theories” are thoroughly debunked in this section, with just a little too much zeal perhaps, but that seems to have been deemed necessary. As if clearing away a potential obstacle right from the start. The first proper museum section provides some pre-context, namely that of Imperial Germany and its military society, where war was seen as positive and more or less automatically equated with victory and greatness. Hitler's failed ambitions as an artist are documented too, and a few stunning examples of his paintings (copies I presume) are on display, including a hilariously kitsch-laden scene of a bellowing stag – the ultimate German cliché. Some of his paintings of architecture, however, aren't actually all that bad. He was clearly better at depicting inanimate scenes. Next is Hitler's participation in WW1 as a simple soldier, on the German side, even though he had been born Austrian (but such minor details were readily overlooked in the recruitment of cannon fodder in WW1) and how he became a Nazi and anti-Semite in the wake of the defeat in the Great War. Hitler's rise to power within the Nazi party (NSDAP) and what role allies like Joseph Goebbels played in it, is the next larger section in the exhibition, culminating in the actual seizing of power by Hitler in Germany as Reich Chancellor in 1933. What followed was the increasing Nazification of society, suppression of the freedom of the press, and repression against Jews, communists, the disabled and other “undesirables” according to Nazi ideology. Two lowlights of this development are especially highlighted: the book burning in 1933 and the nationwide pogroms against Jews of 9 November 1938. An interesting aside here is the coverage of Nazi sympathizers outside Germany, such as in Great Britain and the USA. Also the various reactions and non-reactions by foreign policymakers in other parts of the world (including Stalin and the Molotov-Ribbentrop Pact). Inevitably the following sections relate to war preparations in Nazi Germany and the eventual outbreak of World War Two. This ends the first part of the exhibition and you have to move on one floor downstairs. In this second part of the exhibition the very grimmest topics are brought up – and here it gets really quite graphic. It starts with the pogroms in the east, and the setting up of ghettos. Some especially gruesome images are from pogroms in Lithuania, e.g. naked Jewish women being beaten in the streets … I was somewhat surprised that, given this level of graphic depictions, there seemed to be no age restrictions for visitors ... or at least if there were any they were not enforced, as there were several families with small children in the exhibition when I visited it (June 2018). In a side room two particular war episodes are picked out especially: the Einsatzgruppen massacre of Babi Yar and the Battle of Stalingrad (see under Volgograd), the great turning point for the Third Reich's war effort. The remainder of this part of the exhibition chronicles the home front, the retreat of the German Armies on all fronts and the eventual downfall. Special side sections are about the Battle of Berlin and about Hitler hiding in his HQ bunkers. The latter also serves as the prelude to the exhibition's third and final section, again one floor further downstairs: the “Dokumentation Führerbunker”. This had previously been a stand-alone exhibition, which, before the larger Hitler exhibition was opened, could only be visited on guided tours. Now it's been integrated into the wider context, the need for guided tours accompanying it seems to have been deemed no longer necessary. The first striking element here is a faithful life-size reconstruction of Hitler's study inside the bunker, based on photos taken by the Allies when they discovered the place. This includes the sofa on which Hitler committed suicide (photos of the blood stains on it accompany this part). The construction of the bunker underneath the Reich Chancellery is documented too and there is a detailed scale model of the Führerbunker showing how the interior was organized. Hitler's day-to-day life is covered, as is, of course, the end of it, his and Eva Braun's suicides on 30 April 1945. A side room is about the subsequent suicides of Joseph and Magda Goebbels and the preceding poisoning of their six children. And with all those dark and sobering impressions you exit the exhibition and re-emerge at the Anhalter bunker's rather large museum shop, where you can also purchase a dedicated exhibition catalogue. All in all it has to be said that the Berlin Story bunker has meanwhile established itself as one of the foremost dark-tourism attractions is Berlin, and that's saying something! The Berlin Story exhibition was already good, but with the new additional “Hitler – how could it happen?” exhibition, incorporating the Führerbunker Documentation, they've closed a massive gap. It's the world's first comprehensive museum coverage of all the aspects of this difficult subject matter and the curators have done an admirable job with it. Unmissable. Location: the area of the former Anhalter station lies between the streets Stresemannstraße to the north-east, Schöneberger Straße to the north-west and Möckernstraße to the south-east in the southern part of Berlin's central district of Mitte. The Berlin Story Bunker is just south of this. Access and costs: easy to get to, the station ruins are viewable for free, the museum charges admission fees, separate for its two exhibitions. Details: Easy to get to by regional metro train (S-Bahn, lines S1, S2, S25) to the stop of the same name: Anhalter Bahnhof – it is in fact the old underground part of the former station. From the other attractions further north in Mitte it's also easily walkable. The ruins of the portal are to be found at the northern end of the area along Stresemannstraße. The bunker housing the Berlin Story Museum and Hitler exhibition lies to the south-west of this, off Schöneberger Straße 23a, behind a school complex. It is signposted. The station ruins are freely accessible at all times, but the bunker museum charges an entrance fee and the same applies to the guided bunker tours. Admission to just the Berlin Story Museum costs 6 EUR, including the (optional) audio-guide (available in ten languages). Admission to the separate Hitler exhibtion is 12 EUR, the audio guide (German or English) an additional 1.50 EUR. Note that photography possibly also no longer allowed in the Berlin Story section (the rules published on the website are bit unclear in that latter regard ... when I went it was still possible)! Opening times (for both sections): daily from 10 a.m. to 7 p.m., last admission an hour before closing. Time required: viewing the train station ruins doesn't take more than just a few minutes. The Berlin Story Museum can take between an hour or two (audio-guide running time is 60 mins). The Hitler exhibition will take well over two hours or even three if you want to read absolutely everything and use the audio guide. But since many sections' content was already quite familiar to me I was able to cut the visit down to an hour and a half. Combinations with other dark destinations: in general see Berlin – the 'Topography of Terror' is just round the corner (literally, just a few steps up Anhalter Straße to the north-east of the old station ruins). From there, many of Berlin's other dark attractions are also within waking distance (e.g. Checkpoint Charlie, the Holocaust Memorial, etc.). Across the canal to the south of the former Anhalter station area lies the extensive freight train area associated with the old passenger train station and the northern part of this is occupied by the Berlin Museum of Technology, only a 5-10 minute stroll away. Combinations with non-dark destinations: in general see Berlin – the transport hub of Potsdamer Platz is just up the street (or one bus or S-Bahn stop away), from where most of Berlin's main sights are easily accessible. About the same distance in the other, south-easterly direction is the Willy-Brandt-House. Right on the premises of the former train station, south of the area now given over to sports fields, stands the new "Tempodrom", an event arena built in an architecturally striking modern design (deliberately) reminiscent of a large circus tent.